The Project Management Timeline is the best way to plan your next business project with efficiency and accuracy. The free template is the perfect way to plan your company project in the most simple and straightforward way possible. Whether you need to plan a 12-point strategy that will boost sales for the quarter or you simply want to restructure the front end of your store, this template is the perfect way to organize it all onto one clean page. You can learn more about this free Management Timeline by reading the information below. The first step will be to download the free Project Management sheet file by clicking the link at the bottom of this page. Now, start by personalizing this document to your business. You can give it your own personal feel by adding your company name, the title of the project, and the expected schedule for your project to start and end. You can also add your company logo off to the side at the top of this page as well. This will give it a nice professional look in case you need to present the project plan to multiple people or bring in outside resources. Now, in the timeline section of the Project Management sheet, change the start and end states of the first and last cells. If your project only takes a few weeks, just change the months to weeks instead. Then choose the most important elements of your project, such as meetings and physical labor, and write those on the chart lines. You will also click and drag these lines to the dates corresponding to the event you have listed in them. You’ll also choose to list tasks that will take multiple months/weeks at the bottom of this table. The example given shows “Perform Research,” just change this for your project needs. 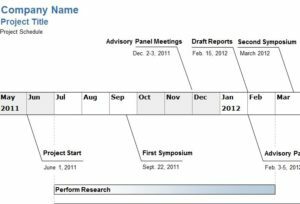 Now you will improve your project efficiency by downloading this free Management Timeline today!